President Donald Trump and Nigerian President Muhammadu Buhari arrive for a news conference in the White House Rose Garden in Washington, April 30, 2018. 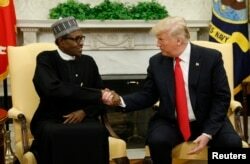 U.S. President Donald Trump meets with Nigeria's President Muhammadu Buhari in the Oval Office of the White House in Washington, April 30, 2018. 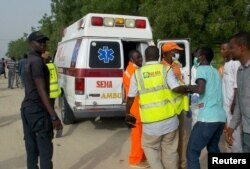 FILE - Rescue workers are seen at the site of an attack by Boko Haram militants in the northeast city of Maiduguri, Nigeria, April 27, 2018. Nigeria is Africa's most populous country, with at least 186 million people, and has a quickly growing economy. Buhari's trip is meant, in part, to secure more U.S. investment. VOA's Esha Sarai contributed to this report.